A massive cluster of yellowish galaxies, seemingly caught in a red and blue spider web of eerily distorted background galaxies, makes for a spellbinding picture from the new Advanced Camera for Surveys aboard NASA's Hubble Space Telescope. 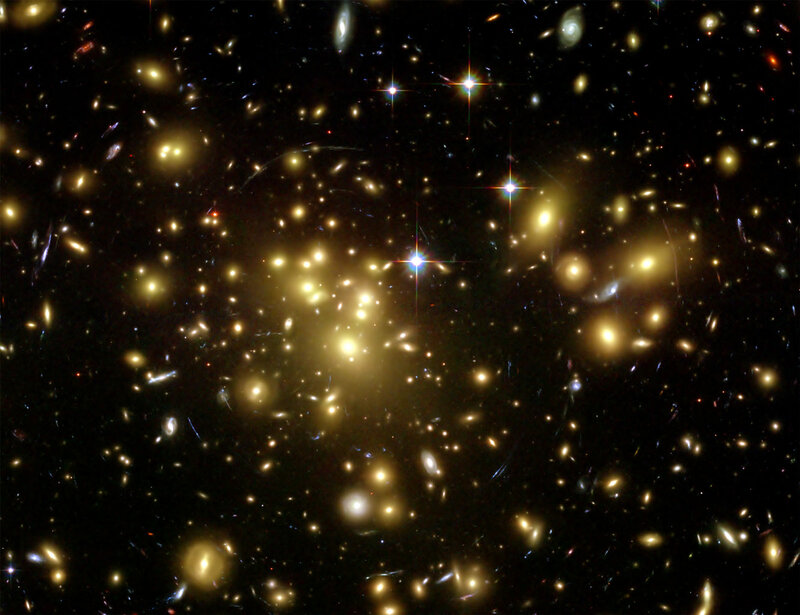 Two billion light-years away, galaxy cluster Abell 1689 is one of the most massive objects in the Universe. In this view from the Hubble Space Telescope's Advanced Camera for Surveys, Abell 1689 is seen to warp space as predicted by Einstein's theory of gravity -- bending light from individual galaxies which lie behind the cluster to produce multiple, curved images. The power of this enormous gravitational lens depends on its mass, but the visible matter, in the form of the cluster's yellowish galaxies, only accounts for about one percent of the mass needed to make the observed bluish arcing images of background galaxies. In fact, most of the gravitational mass required to warp space enough to explain this cosmic scale lensing is in the form of still mysterious dark matter. As the dominant source of the cluster's gravity, the dark matter's unseen presence is mapped out by the lensed arcs and distorted background galaxy images. Available also in the Full Frame, uncropped, raw unprocessed Hubble format. The default is Standard Landscape, which is a slightly cropped image with some background noise elimnated to improve picture quality.